Mimi Pond is an absolute gem. The matriarch of a family of cool artists, she really knows how to weave a funny tale through her cartoons and graphic novels. Her work has been featured here on Boing Boing, as well as in National Lampoon, Village Voice, The New York Times, The New Yorker, and other well-known publications. Mimi has written for Pee-wee's Playhouse, Designing Women, and The Simpsons. 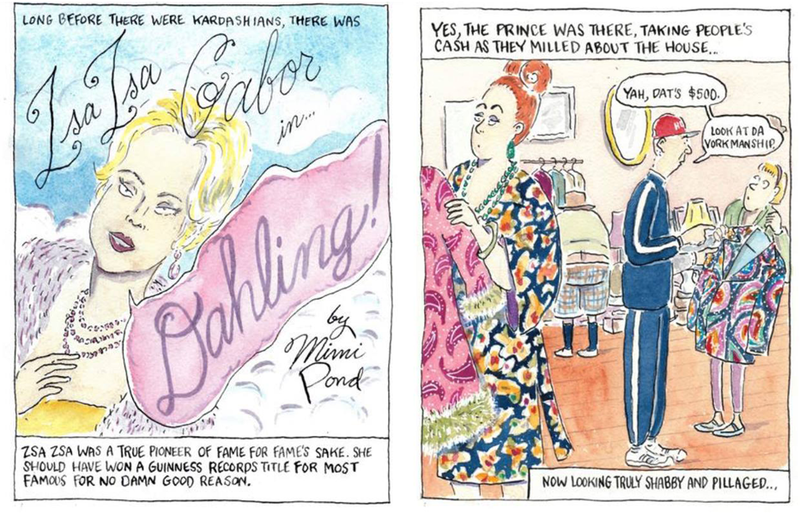 Now, for a new LA Times piece, she's inked a 37-panel cartoon that shares the backstory of the late famous-for-being-famous Zsa Zsa Gabor. It gives a biting, yet humorous, glimpse into the shenanigans she observed at the post-auction garage sale of the Hungarian-born celeb's stuff, which was hosted by her eccentric (and controversial) widower Frédéric Prinz von Anhalt at their Bel Air mansion. I can't show Mimi's entire cartoon here for obvious reasons but it's definitely worth the extra click. I can say this, truth is stranger than fiction. Ben Avlis makes surprising and sometimes slightly disturbing folded cartoons that reveal something surprising when unfolded. Just in time for Father’s Day, here’s a sweet animated film Tend, about a father who becomes too focused on tending a fire, at the expense of his young daughter.